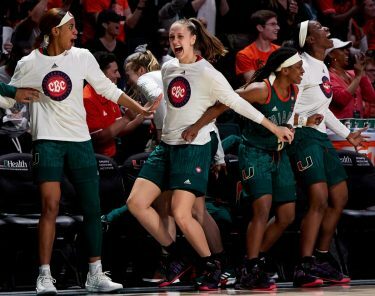 In a game it desperately needed to win to get off the NCAA Tournament bubble, the Miami Hurricanes lost to No. 15 North Carolina 73-64 in front of a sold out crowd at the BankUnited Center on Saturday. After the loss, Miami’s tournament hopes sit in serious jeopardy. UNC (20-9, 10-6 ACC) pulled away from Miami (18-11, 8-8) in the second half, led by 6-9 freshman Brice Johnson. Miami had great trouble containing Johnson; he connected on 11-15 field goals in the game, and scored all 22 of his points in the paint. Johnson found many of his buckets on dump-off passes after Miami brought double teams to Kennedy Meeks and Joel James. Tonye Jekiri, the ACC’s leading rebounder, finished the game with six points and seven rebounds. Jekiri did not record a rebound in the second half. Miami did not make a shot from the field for nearly four minutes down the home stretch, after playing the Tar Heels close all game. 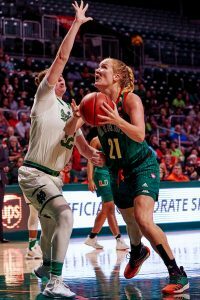 It was a frustrating game for the Hurricanes, who shot just 43 percent from the field, and 6-23 from beyond the arc. “We were six for 23 from three, and that is not good enough to beat them. We needed to make eight or nine three’s [to win], and we didn’t,” Larrañaga said. Larrañaga did not start team captain Angel Rodriguez. Rodriguez sported a light brace on his right wrist, which he sprained while taking a charge against FSU on Wednesday. In Rodriguez’s absence, Larrañaga started Manu Lecomte. Rodriguez attempted to play in the game, but could not use his right hand assertively and only played three minutes. Miami was dominated on the boards, with North Carolina out-rebounding the Hurricanes 42-28. The Tar Heels also had 11 offensive rebounds. “Coming into the game, we knew we needed to have a decided advantage on the rebounds, and it’s something we worked on in practice this week,” said North Carolina head coach Roy Williams. Transfer center Ivan Cruz-Uceda hit back-to-back three’s in the second half to give Miami its first lead since the early minutes of the first half when it led 4-2. Cruz-Uceda finished the game with 11 points off the bench, but the seven-footer did not attempt a shot inside the three-point arc. Sheldon McClellan energized the sold-out crowd and his teammates with a transition dunk with 9:05 to play in the first half. After a steal by Lecomte, McClellan raced ahead of the floor, skied toward the rim – almost hitting it with his head – and threw down a thunderous slam. McClellan, one of the most accurate shooting guards in the nation this season, finished 4-10 from the field and scored 11 points. Foul trouble and the length of North Carolina hindered him all game. Although Miami held the Tar Heels to just 41 percent shooting in the first half, they trailed at the intermission. 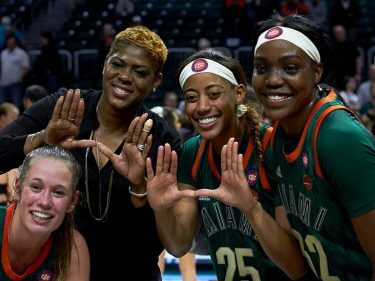 The Hurricanes were just 3-12 from three-point range, and turned the ball over 10 times in the opening period. North Carolina scored 13 points off the Hurricanes’ turnovers, and led Miami 32-30 after the first 20 minutes. Now, Miami goes on the road to face Pittsburgh and Virginia Tech. Pittsburgh sits right above Miami at seventh place in the ACC standings, whereas Virginia Tech is second to last.